If you're overdue for a fresh toothbrush (which, if you're like most Americans, you are), you may find yourself puzzling over what to do with the brush that's been sitting on your bathroom sink for the past several months. It is recyclable, but if you recycle it with the rest of your plastics it will ultimately be sorted out and sent to a landfill. 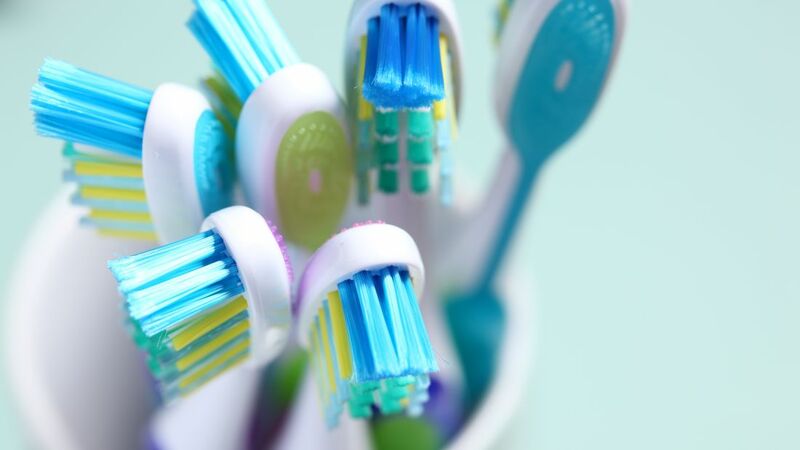 To make sure most of the materials in your toothbrush get reused, Lifehacker reports that you need to send it to a special recycling center. The Colgate Oral Care Recycling Program, a collaboration between Colgate and TerraCycle, accepts not just old toothbrushes but used toothpaste tubes and dental floss containers as well. These items are each made from multiple types of materials, which means they can't be processed by your town's regular recycling plant. Luckily the TerraCycle program is happy to take the components apart for you at no charge. All you need to do is find a box, print the UPS label from their website, slap it on, and mail off your package. Once they're received by the recycling center, the toothbrushes, floss containers, and toothpaste tubes are broken down into their plastic parts, shredded, and melted into a hard plastic that's used to make new products. The program also offers points for shipments of recyclables, which can be redeemed for charitable gifts and donations. That's a worthy excuse to start brushing your teeth and flossing more often.